Today I travelled to Birmingham to visit the city art gallery so that I could have a look at their large collection of Pre-Raphaelite paintings. For many, the Pre-Raphaelite paintings are very loud and garish but to me they are often things of outstanding beauty. My Daily Art Display today features one of the Pre-Raphaelite paintings by Ford Maddox Brown entitled The Last of England which he started in 1852 but did not complete until 1855. You need to remember that some of the things which I describe are not so easy to see in the attached picture but my description is based on the copious notes I made when I stood in front of the original today. Ford Madox Brown, although English, was born in Calais in 1821. His father, Ford Brown was a retired purser in the navy and his mother, Caroline Madox, came from an old Kentish family. He initially studied art in Belgium, France and Italy before coming to England in 1845. Married twice, firstly in 1841 to his cousin, Elizabeth Bromley who died of consumption in 1846 and shortly after married for a second time, to his model, Emma Hill. He had a varied career but although he was highly thought of by his contemporaries, he never achieved popular success. Although older than the members of the Pre-Raphaelite Brotherhood he associated with them and at one time tutored Dante Rossetti. Madox Brown painted many historical pictures and for most of the 1880’s he worked on subjects of local social history for Manchester Town Hall. Ford Madox Brown will always be remembered for what most believe was his greatest work of art, The Last of England. Ford Madox Brown died in 1893, three years after the death of his wife Emma. The painting, The Last of England, depicts a family leaving the shores of England for a better life and a fresh start in Australia. This oval, almost circular, painting makes us concentrate our focus on the faces of the couple, who have literally turned their backs on their homeland. In the picture we see a father, mother and two children wrapped up well against the cold sea breezes as the ship leaves the shores of their English homeland. 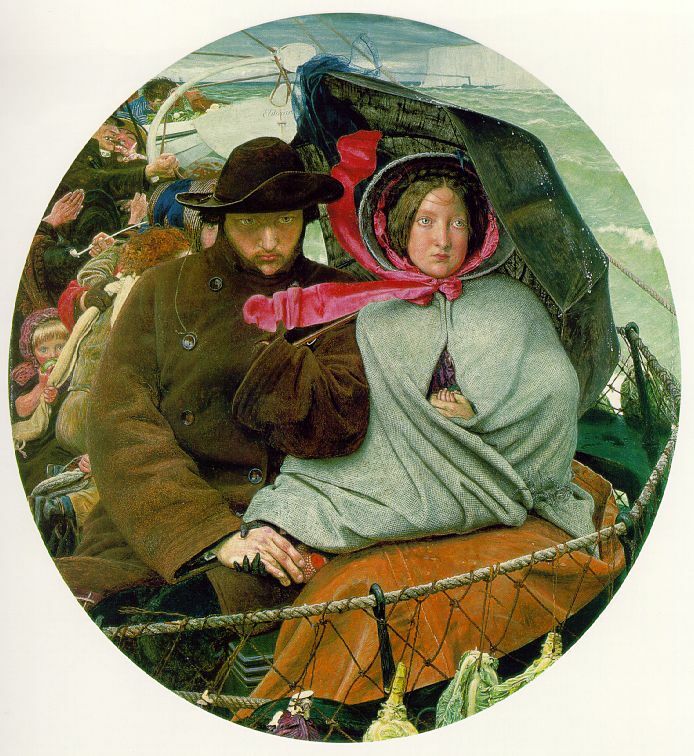 The picture, in some way was inspired by the emigration to Australia of Maddox Brown’s friend, the sculptor Thomas Woolner in 1852. It is ironic that although Maddox Brown started the painting the year Woolner departed from England, he had returned to England the following year, disillusioned by the false promises of wealth to be had from the gold rush. This was some two years before Brown had completed the work. In the mid-nineteenth century there was almost a mass exodus of people from England to America and Australia. Thousands of working-class and lower middle-class people, who were totally disillusioned with their life of poverty and slum-like dwellings, just packed up the few possessions they had and made this long and momentous journey to the other side of the world. They were following their dream and although they believed the “grass would be greener” for them in Australia, they could not but help to worry a little whether they had made the right decision. If we look at the faces of the family in the painting we can see that worried expression and in some ways we can empathise with them even though we know they had a free choice in the matter. It was a momentous decision that they were taking and it would be hard to reverse it and that factor probably played on their minds. This journey to get away from their homeland and go to a safer and better place has parallels with the biblical tale of the Flight into Egypt. Let us look at the painting in more detail. In the background we can make out the white cliffs of England as they are left behind. This rock structure of white chalk is often depicted in paintings which highlight the coast of England. In contrast to the white rock formation we see a black steamship with billowing black smoke coming from its funnel heading for port. The ship that the family is sailing on is surrounded by choppy green seas topped with white crests and this may in some way allude to the testing and difficult times ahead for our emigrants. It is interesting to see in the foreground netting around the lifeboat deck, hanging on which are some of the ship’s fresh vegetable supplies. We can see some cabbages and wonder how long they will remain fresh during this long, probably six to eight week journey. If we look behind “our family” we can see a small child wearing a pink bonnet, her right hand grasping the scarf warn by her mother, whilst she eats an apple held in her other hand. Somebody, slightly hidden from view, can be seen smoking a long clay pipe but the characters that amuse me the most, and who are just visible in the background in this painting, are a pair of angry men arguing. The man wearing the top hat has turned away and as he looks back at the departing coastline, waves his fist at it. To this man, his departure from England is a thing of joy and for some reason he seems to be cursing the country he has just left behind. The main characters in this painting are the father and mother and these are portraits of the artist himself and his second wife and beloved model Emma Hill. The small fair-haired girl in the background eating the apple is their daughter Katty and the baby hidden from view is their son, Oliver. The father is tightly wrapped up in his warm brown woollen coat. His hat is being buffeted by the strong winds but see how there is a “safety string” from the hat attached to and wrapped around a button of his coat. The sight of the father with his grim determined face says it all for me. This is a journey into the unknown and probably he is still racked with doubt with regards his decision to remove his family from the safe environment of their home and whisking them off to a foreign land. It still troubles him but he knows that he and his family cannot go back now and so his resolute look tells us that he is determined to see the venture through to its conclusion. The look on the face of his wife is indicative that she too has concerns about their venture. Her small, slim black leather gloved-hand tightly grasps her husband’s bare workman-like hand, the force of which wrinkles his skin. It is, in a way, a sign that she supports him and it lets him know that fact. Her other hand is holding the tiny fingers of the baby she cradles in her arm and which is hidden from view inside her warm woollen cape. She is wearing a pink bonnet which is partly covered by the grey hood of her cape but we see the pink ribbons of her bonnet flying horizontally in the gale-force wind. It is a touching picture of a family on the move. And it was at these times that he, himself, thought about emigrating to Australia. A well written and insightful commentry into one of Brown’s more famous paintings, A lot of thought has evidently been put into the writing of this. Keep up the good work!